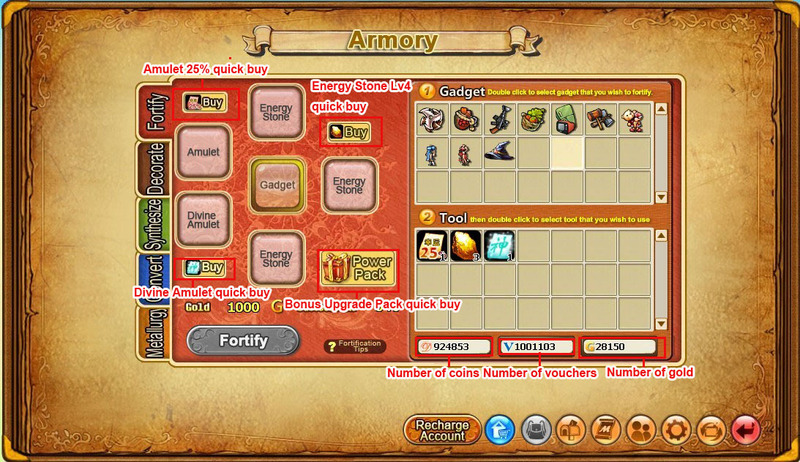 This is a system that you level up your weapons, hats and clothes by fortifying them, and the higher the fortifying level is, the greater the risk will be, but the attribute of the items will also be higher after you succeed. The fortification can be done only if you have the energy stone and material for the fortification. The materials for the fortification include Amulet and Divine Amulet. The Amulet 25% can add 25% chance of your current success rate, and the Amulet 15% can add 15% chance of your current success rate. The Divine Amulet can help you keep the level of your voucher articles when they fail in fortifying.